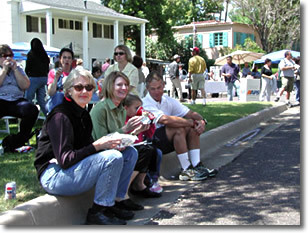 Welcome to the Encanto-Palmcroft Historic Home Tour and Street Fair! 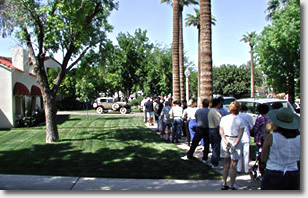 Home Tour Day is a great day to get out of the house and see how other people live -- specifically those in one of the most talked about historic neighborhoods in Arizona. You will want to park at Encanto Park or somewhere in the neighborhood. You can buy your tickets and a refreshment at Holly and 12th Avenue where we will also have a street fair, food vendors and a beer garden. On an old-fashioned trolley ride you can listen to a tour guide give you a fascinating commentary on the history of the neighborhood. Your ticket booklet will provide information about each specific house, its history, famous people who may have lived in it, interesting architectural features, and more. If you walk into the neighborhood from an adjacent neighborhood, you may purchase tickets at the corner of Holly and 12th Avenue (map). 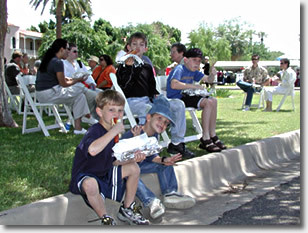 There you will find live entertainment all day long, dozens of vendors selling everything from arts & crafts to food. A bake sale will provide a smorgasbord of delectable items baked by our residents and several wine baskets awarded by raffle. 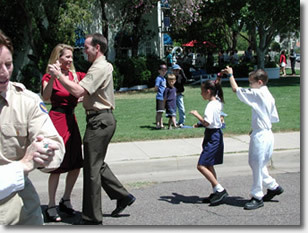 You can walk from one house to another or take a trolley to within 1/2 block of each house. Although there's not a great deal of walking required, wear your comfy shoes. We will have chairs along the way in case you'd like to just sit and soak in our beautiful weather, festive environment. You may even find yourself fondly reminiscing over "the good ol' days". 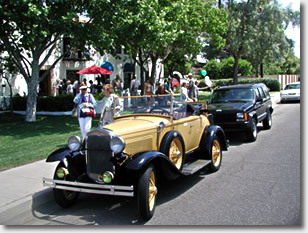 Along the route, you'll find portable restrooms, refreshments, and a beautiful collection of historic automobiles (Model T, Model A, etc). Of course, you'll also see many additional beautiful homes and gardens throughout your day. The tour runs from 10:00 to 4:00 rain or shine. You'll want to be here by noon if you want to see all the homes and spend some time at the festivities at 12th Ave and Holly (map). I know why you came to this section of our website; and I also know why you will come to our 2019 Home Tour and Street Fair. Guess what? We'll all be there for the same reasons. You will come to experience the visions and labors of many dreamers, planners, architects, craftsmen, designers, builders, civil servants and homeowners. 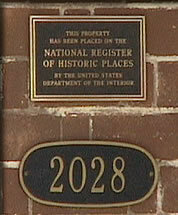 Over the past 85 years, they have all invested in the reality of a friendly, diverse, unique and welcoming neighborhood. Right here in the heart of Phoenix. We will be happy to share this civic gem with you. We thank our predecessors for their past and present efforts. We thank you for your investment in our future. Your financial support will be used to help preserve and improve many elements of our neighborhood, along with our local parks, schools and social programs. We also ask for another investment. An investment of your time. Time to really see, to feel, to remember - all that our history offers to teach. There are lessons to be learned here. Good reasons for front porches with chairs and benches that are actually used. If you don't yet understand, you will just need to come, walk and sit for a spell. Go ahead, find yourself a chair. Soon you will see that we're all here for the same reasons. It's a great place to be.